We just learned that the successful “Get your back back. 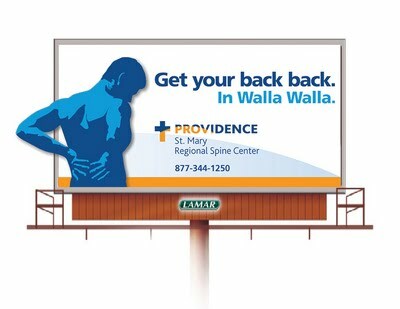 In Walla Walla.” outdoor board we developed with Providence St. Mary Medical Center Regional Spine Center has received a Gold Award from the Aster Awards Competition which honors excellence in medical marketing. The Aster Awards, one of the largest national competitions of its kind, received approximately 3,000 entries from the United States, Canada and South America. Participant’s entries competed against similar-sized organizations in their category. Gold Awards reflect a score that ranks the creative work in the top 5% of entries submitted. Judging criteria includes creativity, layout and design, functionality, message effectiveness, production quality and overall appeal. Short, seven-word headline works with image to create instant understanding that this is an ad for relief of back pain. Alliteration in the headline makes it memorable. Use of the city’s name connects with local readers, and makes it clear to regional readers that the service is in Walla Walla. Vivid colors tie in with the center’s corporate colors, but are also vibrant and suggest health.